The 138th edition of the Carnival of Space, a weekly series highlighting the best in the astronomy and space blogosphere, is now online at Nancy Atkinson's new blog. You know the drill. Some great posts the Mars rover Opportunity's latest travels, Martian dunes as imaged by HiRISE, and the Southern Cross from various exoplanets. I also wanted to take this quick post opportunity to point a few other news items. There was a paper in Nature Geosciences titled, "Origin of the Ganymede–Callisto dichotomy by impacts during the late heavy bombardment," by Amy Barr and Robin Canup. I haven't downloaded this paper, but a great summary can be found at ScienceBlog. Essentially, they found that Ganymede's closer distance to Jupiter and thus being deeper in Jupiter's gravity well, led to more and larger cometary impacts than on Callisto early on in the history of the Solar System. These impacts helped to cause more complete differentiation on Ganymede by bring rock closer to the core and water closer to the surface. Fewer large impacts on Callisto meant that it was less differentiated. Today, Callisto has a more ancient surface with few signs of internal activity, while Ganymede has a convecting iron core producing an internal magnetic field and a surface covered in lanes of grooved terrain separating more ancient terrain. Finally, there are a couple of new Io-related papers in press in the journal Icarus. The first is "A Comprehensive Numerical Simulation of Io’s Sublimation-Driven Atmosphere" by Andrew Walker et al. This paper details a new Monte Carlo simulation of the atmosphere of Io. The other is "Monte Carlo Modeling of Io’s [OI] 6300 Å and [SII] 6716 Å Auroral Emission in Eclipse" by Chris Moore et al. 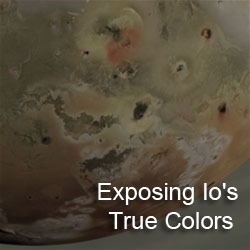 This paper will also look at modeling of Io's atmosphere. 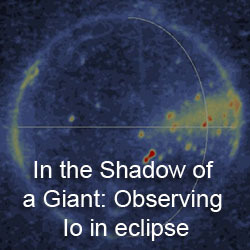 In this case, the authors are attempting to recreate observations of Io's aurorae, seen in eclipse in May 1997. 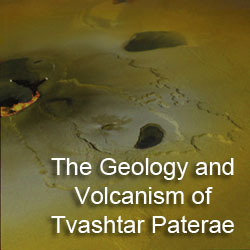 Both these papers have associated LPSC abstracts so I will combine the discussion of them into one post in the next week.